English (Translate this text in English): The Stellwagen Bank National Marine Sanctuary off MA offers SCUBA divers a chance to explore an offshore environment at the mouth of Massachusetts Bay. Exposed waters create challenging dive conditions, but offer rewarding experiences. Surprisingly, fifteen percent of the sanctuary, or 126 square miles, is shallower than 130 feet at low tide. Much of this area lies atop Stellwagen Bank, but also includes southern Jeffreys Ledge and the top of Sanctuary Hill. 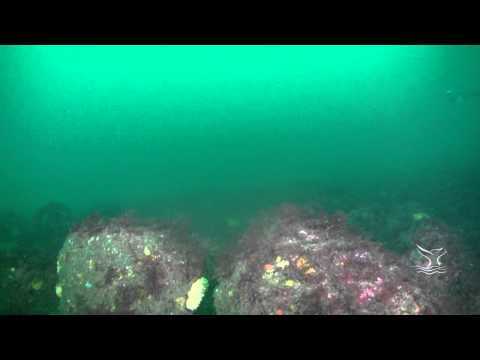 Diving offshore is unlike diving at a similar depth inshore. In addition to the deep water, you will likely experience strong currents at the surface and the bottom, especially if the wind and tide are moving in the same direction. Plan your dive around slack tide for the best underwater and surface conditions. Stellwagen Bank is a glacially deposited sand and gravel feature created by the retreating Laurentide Ice Sheet that covered much of New England during the last period of glaciation. Approximately 10,000 years ago, Stellwagen Bank rose above sea level. Archaeological research may one day find prehistoric human, animal, or plant remains. Stellwagen Bank's shallowest depths are at its southern end, which rises to within 65 feet of the surface. In this area, the sandy bottom is pockmarked with lobster holes. Moving north along the bank’s top, the seafloor slopes to a relatively constant depth of 100-110 feet. While diving the bank’s sandy areas offers the opportunity to view schooling fish, areas with hard bottom habitat will likely prove more rewarding to visit. 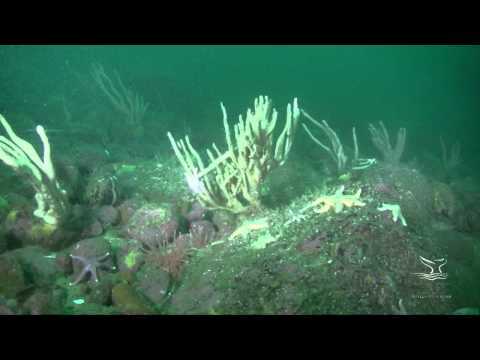 The Stellwagen Bank National Marine Sanctuary off MA offers SCUBA divers a chance to explore an offshore environment at the mouth of Massachusetts Bay. Exposed waters create challenging dive conditions, but offer rewarding experiences. Surprisingly, fifteen percent of the sanctuary, or 126 square miles, is shallower than 130 feet at low tide. Much of this area lies atop Stellwagen Bank, but also includes southern Jeffreys Ledge and the top of Sanctuary Hill. Diving offshore is unlike diving at a similar depth inshore. In addition to the deep water, you will likely experience strong currents at the surface and the bottom, especially if the wind and tide are moving in the same direction. Plan your dive around slack tide for the best underwater and surface conditions.